Well, it's Friday and it's raining. Hardly a surprise. I feel like it's always raining these days. It took six hours for my shoes to be dry enough to wear on Tuesday after walking from my car to my office. Swimming would have been a drier option. It was that bad. I hear it's supposed to be nice on Sunday. I guess we'll see. Some nice warm summery weather would be a welcome change after such a rainy spring. Since it's Friday and after five, I figured I'd share a mojito recipe. 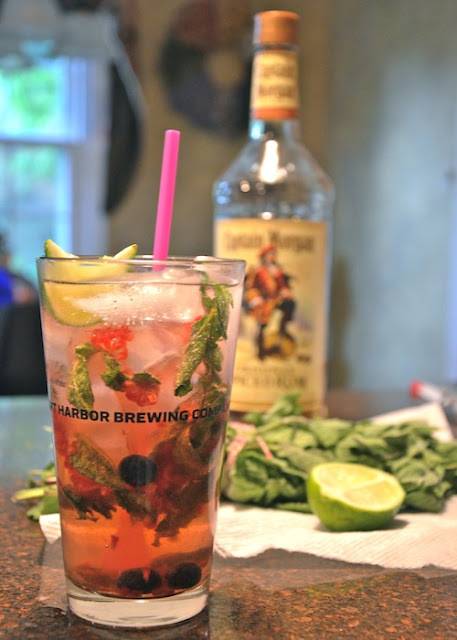 I was inspired by a recipe for strawberry mojitos in Coastal Living but didn't have any on hand so we substituted with raspberries and blueberries and used JD's off the top of his head recipe. Muddle about 1oz or a hand full of mint and some berries in the bottom of a glass. Add 2oz of simple syrup, squeeze half of a lime into the mixture, and stir. Add as much or as little rum as you'd like. Traditionally you'd use about 1oz of light rum but you can use spiced too. Fill the glass with ice and top with seltzer. A quick stir and enjoy!